He regularly exhibits in the south west and London including at the Royal Institute of Painters in Water Colour (RI). 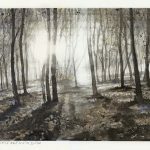 His recent sell-out solo exhibitions featured plein air watercolours completed in the dappled light of Dorset woodlands. They are a celebration of the trees, focusing on the emblematic ash and the 1,058 different species dependent on them, all threatened by ash dieback.